Former champion Ding Junhui was beaten 6-3 by Joe Perry in the first round of the Masters at Alexandra Palace. England's Perry stroked in breaks of 79 and 104 to lead, before going 4-2 ahead after nicking the sixth frame on the final black. China's Ding won the next frame by a point, but Perry clinched the two he needed including a century to advance. Two-time champion John Higgins was knocked out of the tournament after losing 6-4 to Mark Allen. The match began with real quality, Scotland's Higgins making two centuries and Allen one as the pair were locked at 3-3. Allen went 5-3 up and although Higgins got one frame back with a break that ended with a missed yellow when on for a 147, the Northern Irishman sealed the win. 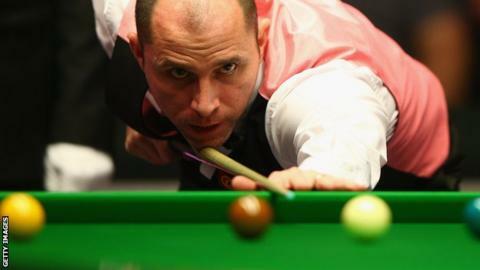 "I like to think I am good under pressure, I have good bottle," Allen told BBC Sport after his victory. "I had it in the back of my mind to stay positive. I have a good record against him recently and he has been struggling." Higgins has not won a ranking event since the Shanghai Masters in 2012 and his form has declined over the last couple of seasons. Although he showed flashes of brilliance with three centuries and a 96 in an enthralling encounter, Allen capitalised on his mistakes to progress.